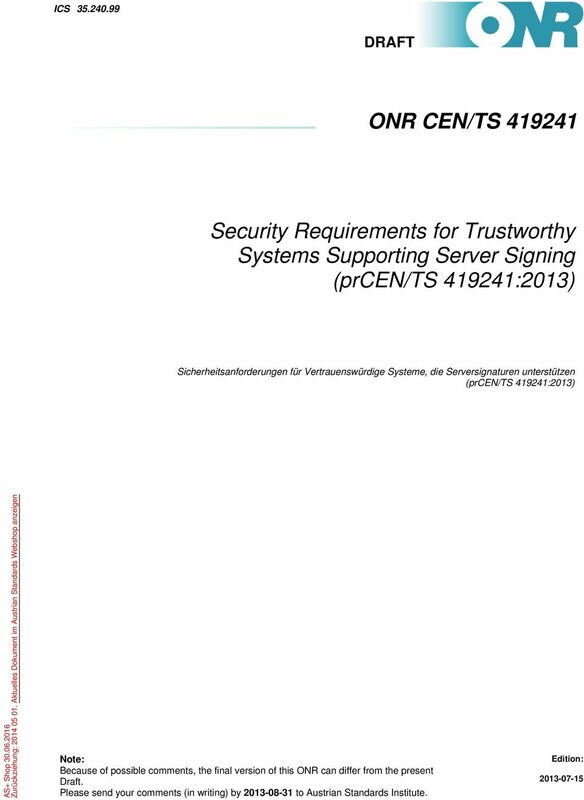 Download "ONR CEN/TS 419241. 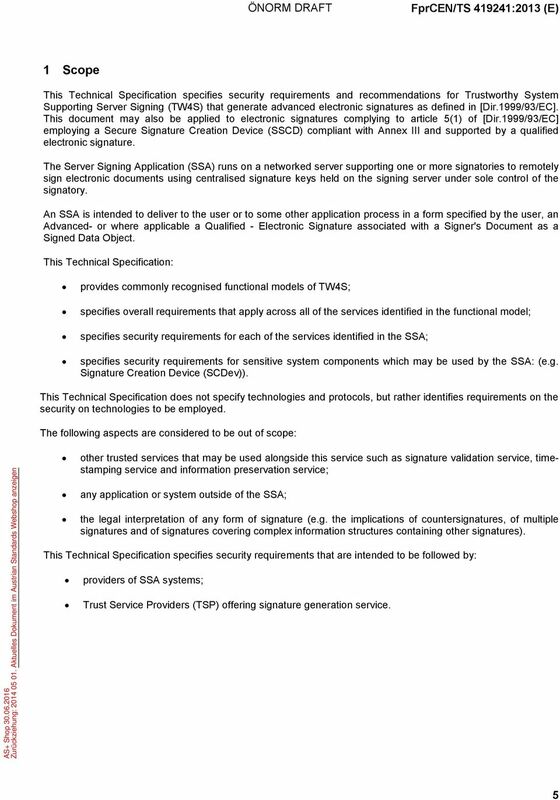 Security Requirements for Trustworthy Systems Supporting Server Signing (prcen/ts 419241:2013) DRAFT ICS 35.240." 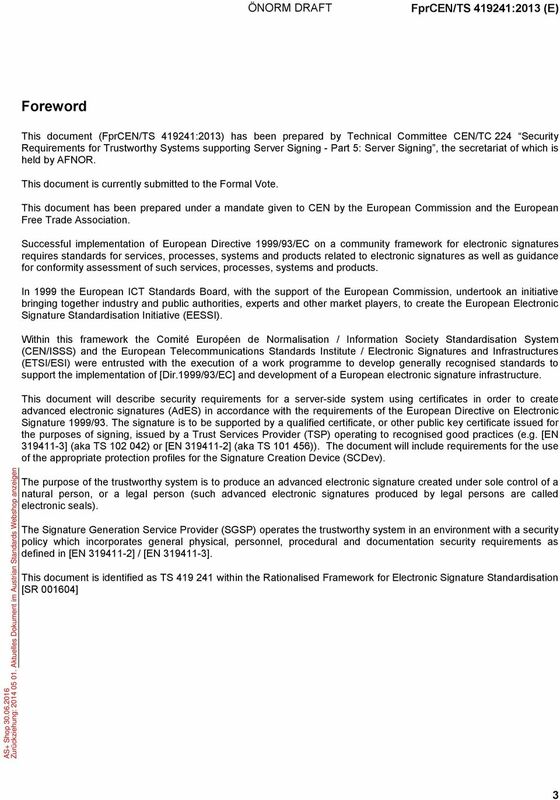 ONR CEN/TS 15945. 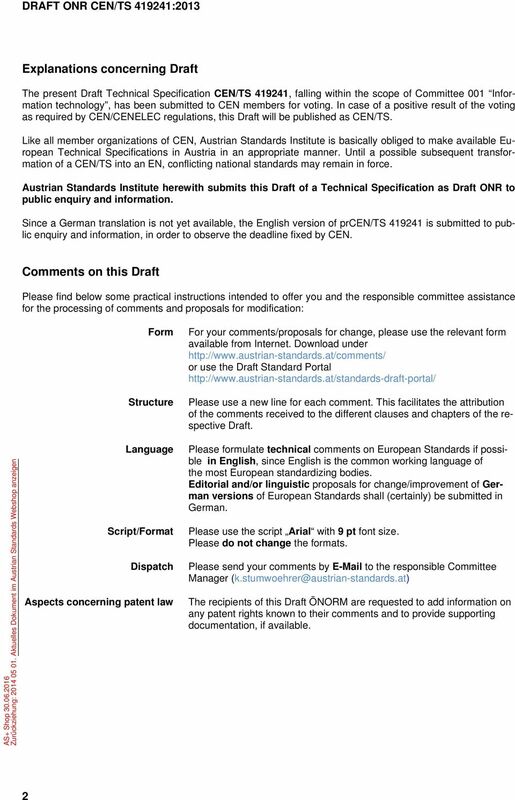 Packaging Ease of opening Criteria and test method for evaluating consumer packaging (CEN/TS 15945:2010) DRAFT ICS 55. MEDICAL LABORATORIES - PARTICULAR REQUIREMENTS FOR QUALITY AND COMPETENCE (ISO 15189:2007) IRISH STANDARD I.S. 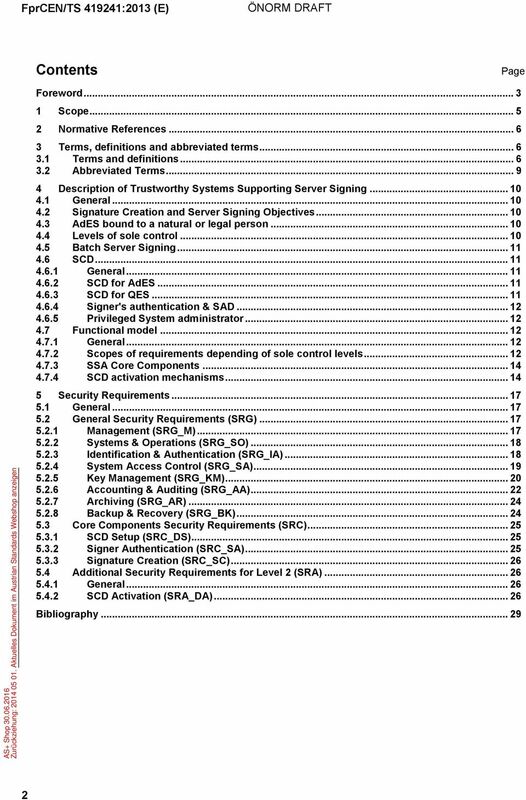 EN ISO 15189:2007. English version. 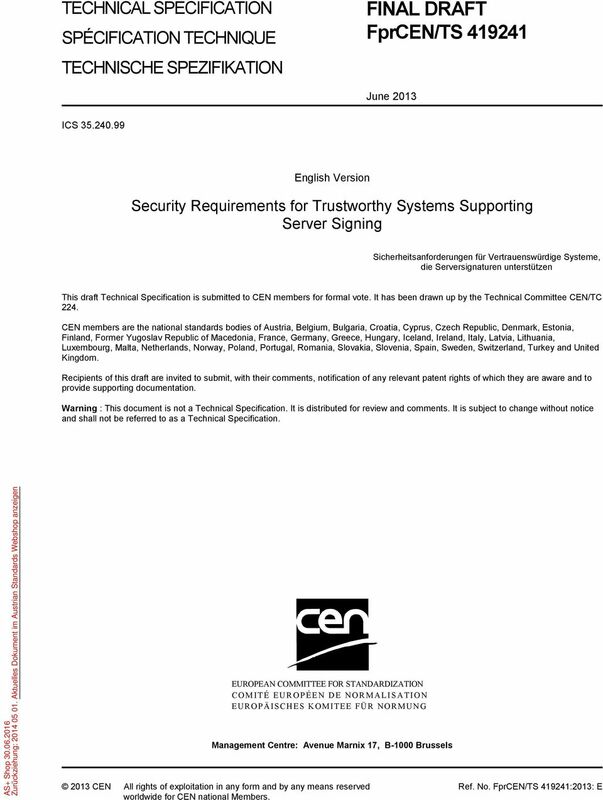 This CEN Workshop Agreement can in no way be held as being an official standard developed by CEN and its Members. AEROSPACE SERIES - QUALIFICATION AND APPROVAL OF PERSONNEL FOR NON-DESTRUCTIVE TESTING IRISH STANDARD I.S. EN 4179:2006. PELLET BURNERS FOR SMALL HEATING BOILERS - DEFINITIONS, REQUIREMENTS, TESTING, MARKING IRISH STANDARD I.S. EN 15270:2007. 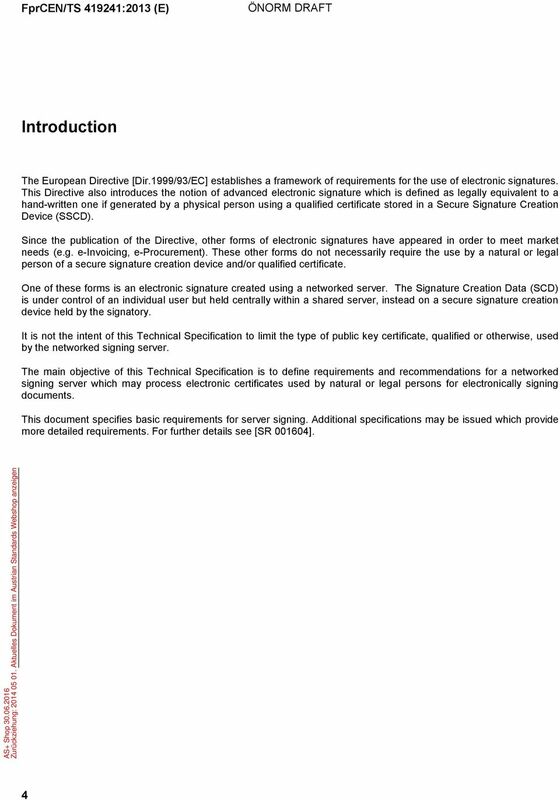 E-Signatures and E-Procurement Dr. Annette Rosenkötter Rechtsanwältin Dr. Anja Hoffmann Rechtsanwältin FPS Rechtsanwälte und Notare Brüssel, 15.06.2011 Dieser Bericht ist nur für den Empfänger bestimmt.